Sacramento, Calif. - Michelle Sekula and her husband Ric Kersey describe themselves as the ultimate recyclers. "We travel to shows, auctions and private estates to get antiques." said Michelle. "It's just a constant thrill of the hunt. We say we have a hobby that went seriously awry." 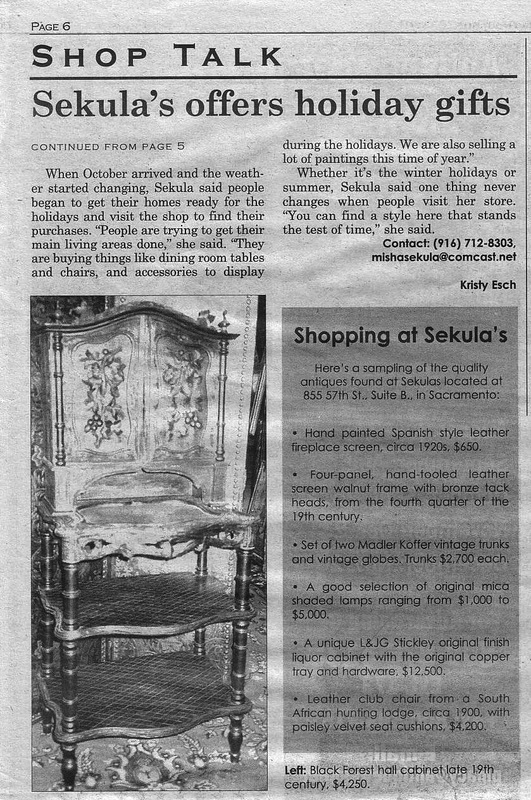 While they are collectors, Michelle said their primary goal is to find unique pieces for customers of their antique shop, - Sekula's, located at 855 57th St, Suite B. 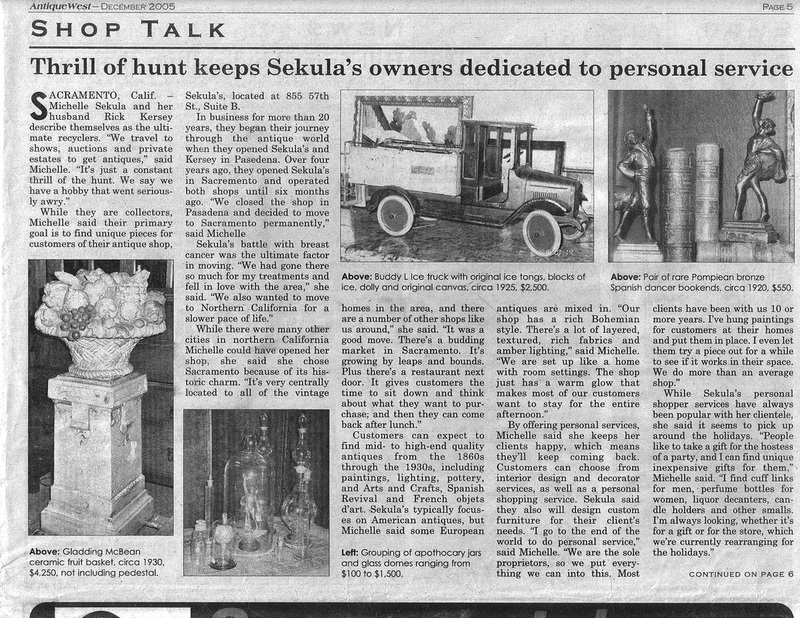 In business for more than 20 years, they began their journey through the antique world when they opened Sekula's and Kersey in Pasadena. Over four years ago, they opened Sekula's in Sacramento and operated both shops until six months ago. "We closed the shop in Pasadena and decided to move to Sacramento permanently," said Michelle..."we wanted to move to California for a slower pace of life." While there were many other cities in northern California Michelle could have opened her shop, she said she chose Sacramento because of its historic charm. "It's very centrally located to all of the vintage homes in the area, and there are a number of other shops like us around." she said. "It was a good move. "There's a budding market in Sacramento. It's growing by leaps and bounds. Plus there's a restaurant next door. It gives customers the time to sit down and think about what they want to purchase, and then they can come back after lunch." Customers can expect to find mid- to high-end quality antiques from the 1860s through the 1930s, including paintings, lighting, pottery, and Arts and Crafts, Spanish Revival and French objets d'art. Sekula's typically focuses on American antiques, but Michelle said some European antiques are mixed in. "Our shop has a rich Bohemian style. There's a lot of layered, textured, rich fabrics and amber lighting," said Michelle. "We are set up like a home with room settings. The shop just has a warm glow that makes most of our customers want to stay for the entire afternoon." By offering personal services, Michelle said she keeps her clients happy, which means they'll keep coming back. Customers can choose from interior design and decorator services, as well as a personal shopping service. Sekula said they also will design custom furniture for their client's needs. "I go to the end of the world to do personal service," said Michelle. "We are the sole proprietors, so we put everything we can into this. Most clients have been with us 10 or more years. I've hung paintings for customers at their homes and put them in place. I even let them try a piece out for a while to see if it works in their space. We do more than an average shop". While Sekula's personal shopper services have always been popular with her clientele, she said it seems to pick up around the holidays. "People like to take a gift for the hostess of a party, and I can find unique inexpensive gifts for them," Michelle said. I find cuff links for men, perfume bottles for women, liquor decanters, candle holders and other smalls. I'm always looking, whether it's for a gift or for the store, which we're currently rearranging for the holidays.". ﻿ When October arrived and the weather started changing, Sekula said people began to get their homes ready for the holidays and visit the shop to find their purchases. "People are trying to get their main living areas done," she said. "They are buying things like dining room tables and chairs, and accessories to display during the holidays. We are also selling a lot of paintings this time of year." Whether it's the winter holidays or summer, Sekula said one thing never changes when people visit her store. "You can find a style here that stands the test of time," she said. • Four-panel, hand-tooled leather screen walnut frame with bronze tack heads, from the fourth quarter of the 19th century. • Set of two Madler Koffer vintage trunks and vintage globes. Trunks $2,700 each. • A good selection of original mica shaded lamps ranging from $1,000 to $5000. • A unique L&JG Stickley original finish liquor cabinet with the original copper tray and hardware, $12,500. • Leather club chair from a South African hunting lodge, circa 1900, with paisley velvet seat cushions, $4,200. • Gladding McBean ceramic fruit basket, circa 1930, $4,250, not including pedestal. • Grouping of apothecary jars and glass domes ranging from $100 to $1,500. • Pair of rare Pompeian bronze Spanish dancer bookends: circa 1920, $550. • Black Forest hall cabinet, late 190th century, $4,250. • Buddy L Ice truck with original ice tongs, blocks of ice, doily, and original canvas, circa 1925, $2500.